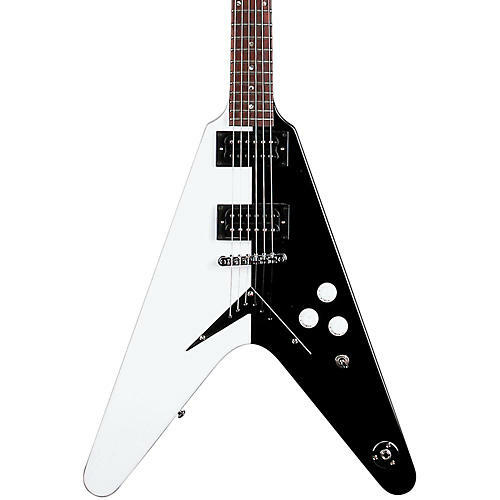 The Dean Michael Schenker Standard Electric Guitar is an affordable Michael Schenker signature model with the classic black and white finish. It features the Series II classic V headstock, a basswood body, bolt-on maple neck, dual humbucking pickups, Grover tuners, and tons o' 'tude.Case sold separately. The Dean Michael Schenker Standard Electric Guitar is an affordable Michael Schenker signature model with the classic black and white finish. It features the Series II classic V headstock, a basswood body, bolt-on maple neck, dual humbucking pickups, Grover tuners, and tons o' 'tude.